Even though Soviet citizens could get in trouble with the authorities for telling political jokes, during the Era of Stagnation, as the Brezhnev period was known, many people made fun of the all-seeing Communist Party and its leader. 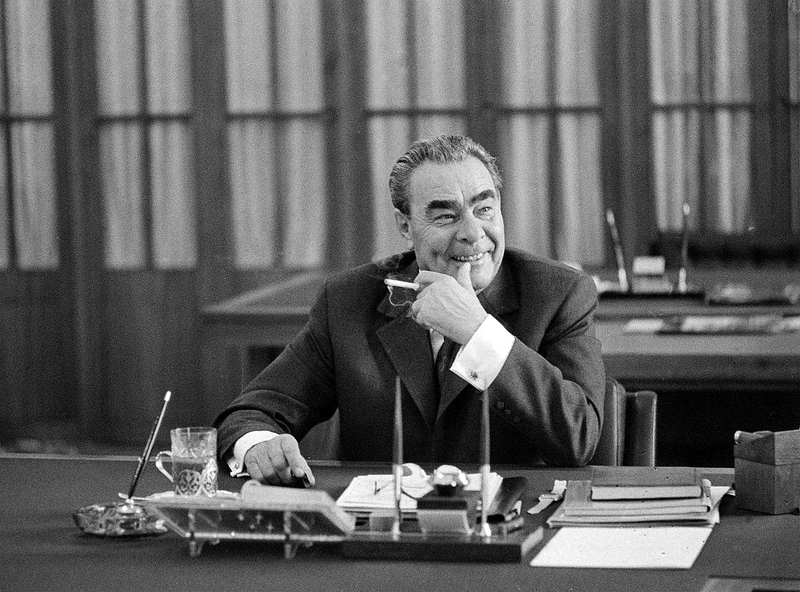 Photo: Leonid Brezhnev in his study in the Kremlin, Moscow. Leonid Brezhnev, who headed the Soviet Union for 18 years, is remembered not only as a politician but also as a target for jokes. RBTH presents a few of these in honor of the 110th anniversary of Brezhnev’s birth on Dec. 19. The Brezhnev era was a golden age of Soviet political humor. It was a time of kissing politicians, absurd vanity and old men in the Politburo. All of this was reflected in anecdotes that were told in hushed voices across the Soviet Union. A man turns on the TV. On the first channel, dear Leonid Ilyich is delivering a speech. The man switches to the second channel: Brezhnev again. Channel three: still Brezhnev. He turns to the fourth channel, and it’s showing a KGB colonel who shakes his fist and warns: "You’d better stop changing channels…"
Lenin proved that even female cooks could manage a country. Stalin proved that just one person could manage a country. Khrushchev proved that a fool could manage a country. Brezhnev proved that a country doesn’t need to be managed at all. With Lenin, it was like being in a tunnel: You‘re surrounded by darkness, but there’s light ahead. With Stalin, it was like being on a bus: One person is driving, half the people on the bus are sitting [ed. “sitting” in Russian has a secondary meaning of doing time in prison] and the other half are quaking with fear. With Khrushchev, it was like at a circus: One person is talking, and everyone else is laughing. With Brezhnev, it was like at the movies: Everyone’s just waiting for the film to end. Long before becoming general secretary of the Communist Party, Leonid Brezhnev fought in World War II. The defining moment of his military career was participating in the defense of the Malaya Zemlya (Little Land) bridgehead near Novorossiysk (760 miles south of Moscow). In World War II history, the battle for Malaya Zemlya was not regarded as being particularly strategically significant, but in the first volume of Brezhnev's autobiography (published in 1978, after he had been in power for 12 years) it was depicted as one of the war’s key battles. According to literary critic Konstantin Milchin, the purpose of this interpretation, was "to explain that it was Brezhnev (a colonel at the time) in particular who won the Great Patriotic War." The Battle of Stalingrad, in which over a million Soviet soldiers died defending the city from a Nazi invasion between July 1942-February 1943, was actually one the most important battles of World War II and is regarded as a turning point in the war. One of Brezhnev's most famous characteristics was a tendency to kiss other world leaders. He would generally start with a peck on each cheek and then go in for a final kiss on the lips. -What has four legs and forty teeth? -And forty legs and four teeth?